For several years, the Nissan Altima has been a vehicle that we’ve trusted and enjoyed driving as one of the most impressive midsize sedans on the road. This comfortable and roomy vehicle is one of the most engaging cars in its class to offer you a ride that’s what you want on the road while also being a stylish and sophisticated car for you to drive. The seats are supportive and comfortable and can be had in either cloth or leather upholstery to give you the driving comfort you want. You’ll appreciate the excellent visibility offered in this car as well. Take a look at the exterior of the Nissan Altima and it will feel like you’ve seen this car before. That’s because this model resembles the rest of the car lineup from Nissan to ensure you can have the quality drive and look you want. The V-shaped grill shows off up front while the rear gives you a sporty feeling with an expressive bumper and horizontal taillights. In the 2.5R model, you’ll even see a subtle integrated spoiler for the look of the drive you’re going to love when you get out and drive. There are five trim levels for the 2018 version of the Nissan Altima. At the base model, you’ll have a power package, air conditioning, push-button starting, keyless entry, and Bluetooth connectivity. Move up to the next level and enjoy a power driver’s seat and larger wheels for the drive. Every model of the Altima also brings you automatic emergency braking and intelligent forward collision warning to make sure you have more safety on the road. There are a variety of excellent features for you to enjoy when you continue to move up the trims of the Nissan Altima. You’ll have two engines to choose from under the hood of the Nissan Altima, both of which are naturally aspirated. The base engine is a 2.5-liter four-cylinder mode that gives you 179 horsepower and 177lb.-ft. of torque while the upgraded model is a 3.5-liter V6 that provides you with 270 ponies and 251lb.-ft. of torque. Both of these engines make use of a CVT automatic transmission for the drive that you want. You’ll have as much as 38mpg of fuel mileage on the highway when you get behind the wheel of the Nissan Altima for your daily ride. 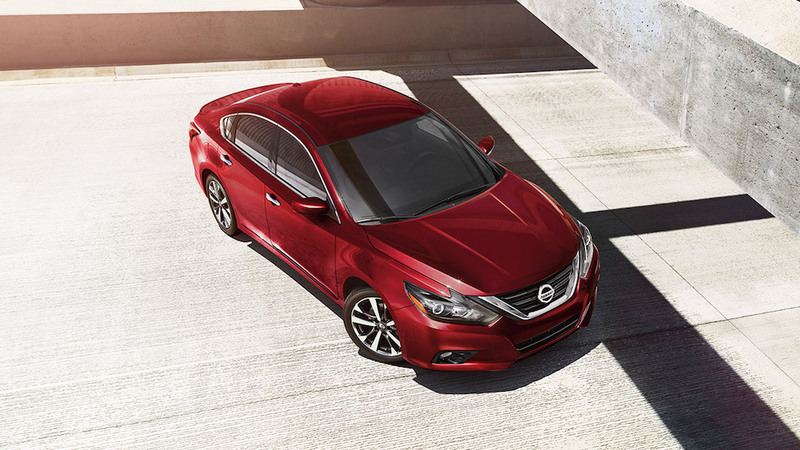 You’re going to be glad you decided to visit your nearby Nissan dealer when you see the Altima and take it for a drive. This car is the midsize sedan that has quality features and comfortable seating to make it an easy choice for you. You’ll love the ability to have a sporty suspension and the fun on the road you want while also benefiting from the advanced safety features that are offered from the standard model on up. Make the right choice and choose the Altima as the car you want to drive every day.